Our range of products include bridge multi blade block cutter. We are the noted trader, importer and supplier of enhanced quality Bridge Multi-Blade Block Cutter. Broadly used for cutting stones, the offered block cutter is developed by using best grade approved raw material and progressive technology. This block cutter is available in numerous sizes based on customer's needs. The offered block cutter can be customized in various specifications. In addition to this, customers can take the offered block cutter at reasonable price. Keeping track with market development we are highly engaged in offering Bridge Multi-Blade Block Cutter. 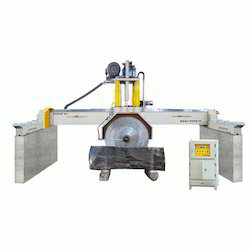 Preferred for cutting stone on different shapes as per requirements, our offered block cutter is one of the most demanded products of customers owing to its strong design. The complete range of block cutter is designed under the guidance of experienced professionals using best available technologies. Our offered block cutter is available with us in various assortment and technical specifications. Customers can take the block cutter at industry leading price.